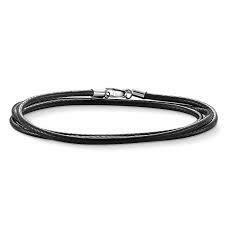 From Thomas Sabo is this classic Brown cord Necklace. An individual necklace that can be personalised. This Brown Cord Necklace 53cm by Thomas Sabo features a silver clasp on the ends of the necklace. The necklace is designed to be attached with Thomas Sabo charms. This gives the necklace a personal touch and adds a lot more meaning. This personalisable necklace would be the perfect gift for her. This necklace is crafted from faux leather and a Sterling Silver clasp.